Many topics in linear algebra are simple, yet computationally intensive, and computer algebra systems such as Mathematica® are essential not only for learning to apply the concepts to computationally challenging problems, but also for visualizing many of the geometric aspects within this field of study. Principles of Linear Algebra with Mathematica uniquely bridges the gap between beginning linear algebra and computational linear algebra that is often encountered in applied settings, and the commands required to solve complex and computationally challenging problems using Mathematica are provided. Kenneth Shiskowski, PhD, is Professor of Mathematics at Eastern Michigan University. His areas of research interest include numerical analysis, history of mathematics, the integration of technology into mathematics, differential geometry, and dynamical systems. Dr. Shiskowski is the coauthor of Principles of Linear Algebra with Maple, published by Wiley. Karl Frinkle, PhD, is Associate Professor of Mathematics at Southeastern Oklahoma State University. His areas of research include Bose-Einstein condensates, nonlinear optics, dynamical systems, and integrating technology into mathematics. 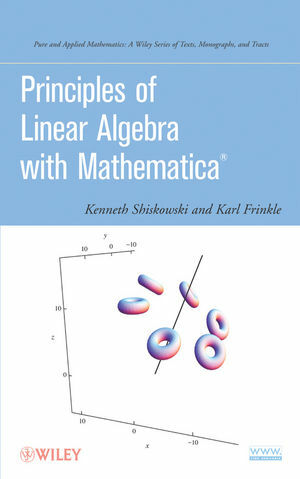 Dr. Frinkle is the coauthor of Principles of Linear Algebra with Maple, published by Wiley. 1. An Introduction to Mathematica. 1.6 Solving Systems of Equations. 2. Linear Systems of Equations and Matrices. 2.1 Linear Systems of Equations. 2.2 Augmented Matrix of a Linear System and Row Operations. 3. Gauss-Jordan Elimination and Reduced Row Echelon Form. 3.1 Gauss-Jordan Elimination and rref. 3.3 Sensitivity of Solutions to Error in the Linear System. 4. Applications of Linear Systems and Matrices. 4.1 Applications of Linear Systems to Geometry. 4.2 Applications of Linear Systems to Curve Fitting. 4.3 Applications of Linear Systems to Economics. 4.4 Applications of Matrix Multiplication to Geometry. 4.5 An Application of Matrix Multiplication to Economics. 5. Determinants, Inverses, and Cramer’ Rule. 5.1 Determinants and Inverses from the Adjoint Formula. 5.2 Determinants by Expanding Along Any Row or Column. 5.3 Determinants Found by Triangularizing Matrices. 6. Basic Linear Algebra Topics. 7. A Few Advanced Linear Algebra Topics. 7.2 “Rolling” a Circle Along a Curve. 8. Independence, Basis, and Dimension for Subspaces of Rn. 8.2 Independent and Dependent Sets of Vectors in Rn. 8.3 Basis and Dimension for Subspaces of Rn. 8.4 Vector Projection onto a subspace of Rn. 8.5 The Gram-Schmidt Orthonormalization Process. 9. Linear Maps from Rn to Rm. 9.1 Basics About Linear Maps. 9.2 The Kernel and Image Subspaces of a Linear Map. 9.3 Composites of Two Linear Maps and Inverses. 9.4 Change of Bases for the Matrix Representation of a Linear Map. 10. The Geometry of Linear and Affine Maps. 10.1 The Effect of a Linear Map on Area and Arclength in Two Dimensions. 10.2 The Decomposition of Linear Maps into Rotations, Reflections, and Rescalings in R2. 10.3 The Effect of Linear Maps on Volume, Area, and Arclength in R3. 10.4 Rotations, Reflections, and Rescalings in Three Dimensions. 11. Least-Squares Fits and Pseudoinverses. 11.1 Pseudoinverse to a Nonsquare Matrix and Almost Solving an Overdetermined Linear System. 11.3 Least-Squares Fits and Pseudoinverses. 12.1 What Are Eigenvalues and Eigenvectors, and Why Do We Need Them? 12.2 Summary of Definitions and Methods for Computing Eigenvalues and Eigenvectors as well as the Exponential of a Matrix. 12.3 Applications of the Diagonalizability of Square Matrices. 12.4 Solving a Square First-Order Linear System if Differential Equations. 12.5 Basic Facts About Eigenvalues, Eigenvectors, and Diagonalizability. 12.6 The Geometry of the Ellipse Using Eigenvalues and Eigenvectors.